This 2TB rocket of an M.2 NVMe drive is the fastest storage available for your PC. When I was testing Samsung’s new 960 Pro M.2/NVMe SSD, a coworker looking over my shoulder at the results declared, “That’s sick!” High praise in today’s parlance, and a direct response to this drive’s incredible speed. It’s a phrase I continued to voice silently as I saw read and write numbers of 2.7GBps and 1.7GBps, respectively, pop up. And that was from the super-conservative AS SSD benchmark with non-compressible data; CrystalDiskMark 5 boasted reads and writes of 3.5GBps and 2.17GBps, respectively, with a 2GB data set. Whoa. At the time of this writing, the 960 Pro is priced around 63 to 72 cents per gigabyte on Amazon: $372 for the 512GB version, $630 for the 1TB model, and $1,299 for the 2TB version. That’s right, there’s a 2TB model thanks to the Samsung 3D/stacked-layer NAND employed on the drives. If you’ve been holding off on M.2/NVMe because of the relatively low capacity (1TB isn’t enough?) then the 960 Pro should eliminate that argument, if not the cost issue. The warranty for the 960 Pro is basically five years, or 400TBW (terabytes written) for the 512GB drive, 800TBW for the 1TB model, and 1,200TBW for the 2TB version. Yes, less of a warranty for your $1,300. Go figure. Our best guess is that getting to 2TB required using less over-provisioning, i.e. NAND set aside to replace failed cells. Regardless, all three ratings are far more than most users will hit over the warranty period, and probably a lot longer. Samsung’s scintillatingly fast 960 Pro M.2, PCIe/NVMe SSD. The write numbers I quoted above are absolutely real, but it took a bit of effort plus a retest to get them. My first test with AS SSD, which uses the FUA (Force Unit Access) command to bypass all caching (for Windows and the drive), saw only 170MBps writing. Not unexpected. What was unexpected was 170MBps in our real-world write tests, which don’t force access. It was puzzling, but I’m guessing that by running these tests immediately following AS SSD, the early 960 firmware was still obeying the FUA command. Other oddities ensued, and then the drive itself died (this happens from time to time with review hardware). The replacement drive I received performed more as advertised. Even in AS SSD, where it really shouldn’t have, given bypassed caching. I’m still investigating, but Samsung hasn’t chimed in at the time of this writing. The upshot is, you should get the numbers I quote as long as you don’t turn off write caching for the drive (Device Manager>Disk Drives>Drive Properties>Policies). The 960 Pro ships with 1MB of DRAM cache for every 1GB of NAND. If the 960 Pro is like other SSDs, a relatively small percentage of that is used for write or read caching, with the majority used for data allocation tables (copied from the NAND). But with the speeds I saw, I’m guessing DRAM caching might play a bigger part than with, say, a SATA SSD. Whatever Samsung is doing, it works. The 1TB 960 Pro we tested is a beast in the very best sense of the word. Peep the purple bars below. Impressive. When it comes to benchmarks, the 960 Pro blows away the competition. And the benchmarks generally are indicative of the impact on everyday Windows performance. On the other hand, the real-world copy tests shown below displayed some mild improvement in sustained throughput, but also revealed the practical limits of what a “faster” NVMe SSD can do for you. While the benchmarks above show drastic improvement, real-world copy performance and hands-on, subjective Windows performance don’t mirror them. 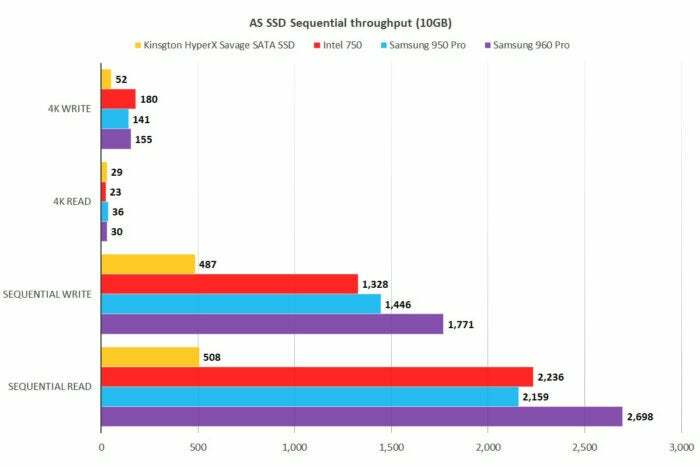 That’s of course comparing the 960 Pro to other NVMe SSDs, the slowest of which eliminates most storage lag. Compared to SATA hard drives or SSDs? We’re talking light years better. For sustained throughput, the 960 Pro shows significant improvement over the 950 Pro and is quite a bit better than Intel’s 750. But the smaller file and folder write numbers (at the top) are actually a bit worse than the previous generation. As you can also see, the Intel 750, which is a PCIe card SSD and not suitable for laptops, is very fast with the 20GB folder of smaller files. Intel has previously informed us that the company’s SSDs are tuned specifically for servers with their high volume of I/O requests for smaller bits of data, and closely interact with the company’s Rapid Storage Technology (RST) to some benefit. That’s my guess about the drive’s dominance in that test. The 960 Pro turned in great numbers. What do they mean? So much of what makes Windows and applications seem slow is storage-related, so switching to any NVMe can make a system seem sensationally faster. 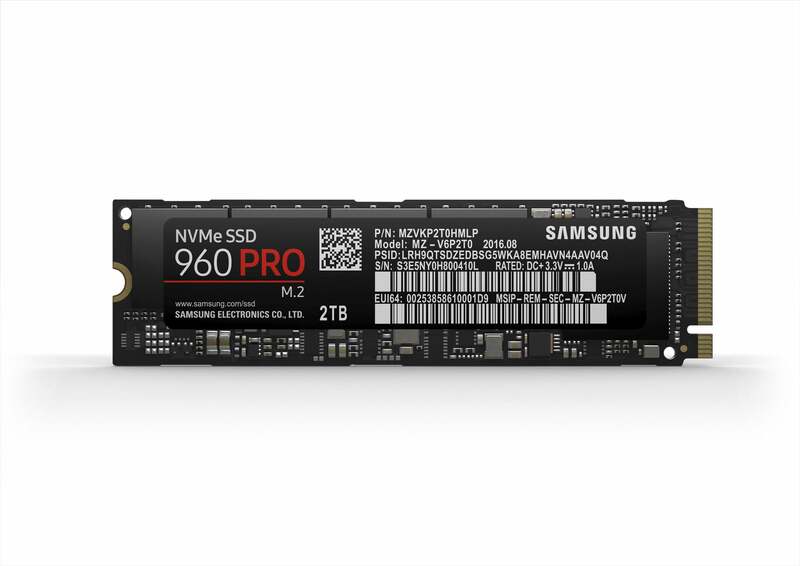 As for the 960 Pro in particular, it’s easily the best consumer NVMe SSD for those who deal regularly with large files. The only caveat is that your system must support booting from NVMe to make the best use of it (i.e. make the operating system faster). Many PCs do not. Note: The 512MB version of the 960 Pro is a bit slower due to fewer chips and channels to distribute the data over. 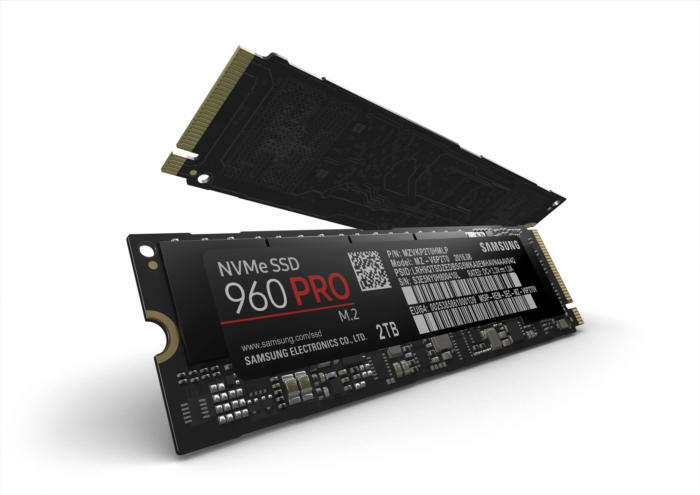 If your laptop or desktop supports the 960 Pro, then it’s the consumer-grade NVMe SSD you want. Assuming the price is competitive, that is. If you find others at substantial savings, you’ll be nearly as impressed. 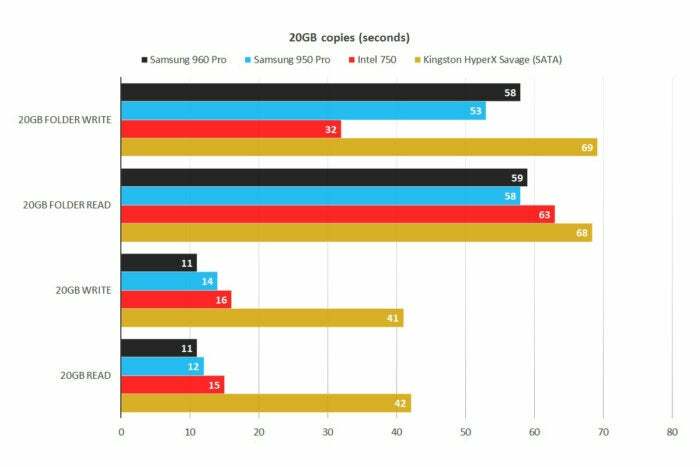 Copying 20GB in 11 seconds as opposed to 12 isn’t an earthshaking difference, and the 960 Pro is merely average for an NVMe drive when it comes to smaller data requests. That said, if someone dropped a 2TB 960 Pro in my lap, I’d gladly alter my setup to accommodate it.